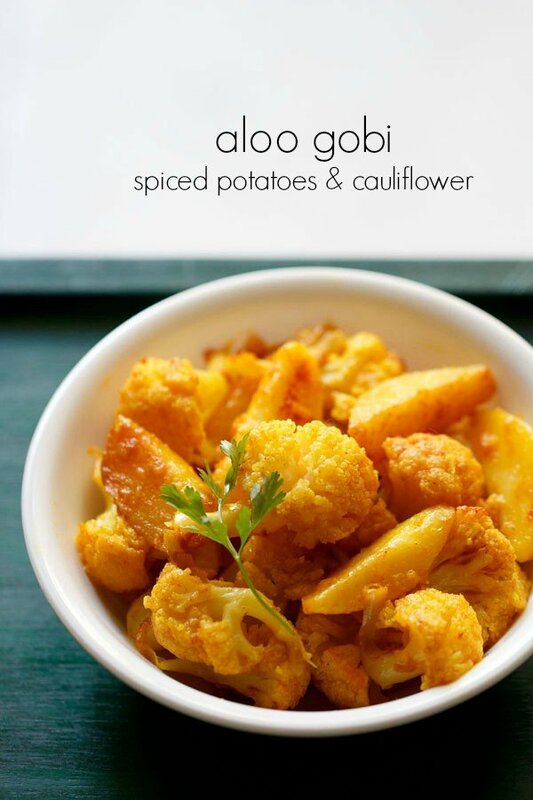 aloo patta gobhi sabzi recipe - simple homely recipe made with potatoes and cabbage. 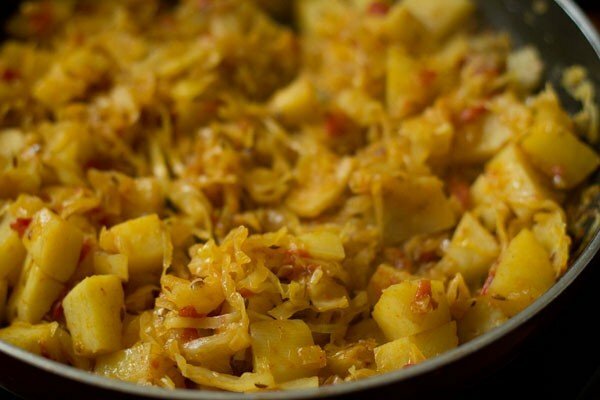 cabbage potato recipe with step by step photos. 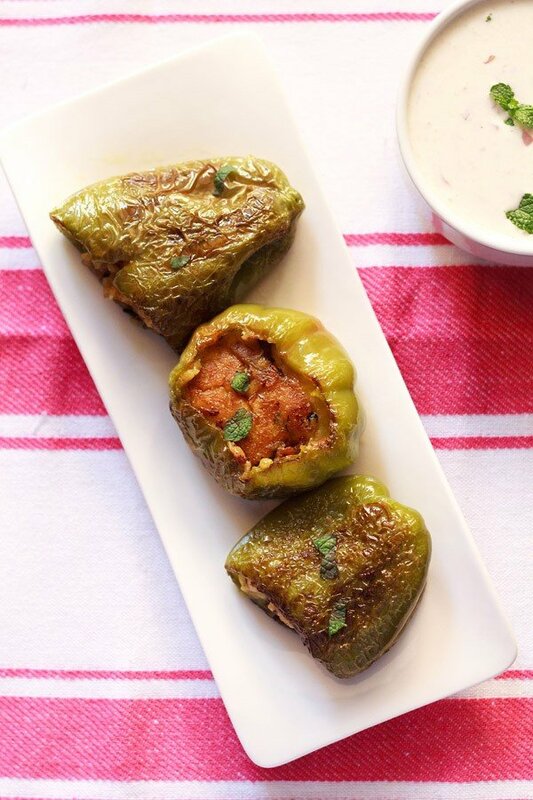 this dish is a simple homely recipe of a dry sabzi made with potatoes and cabbage. 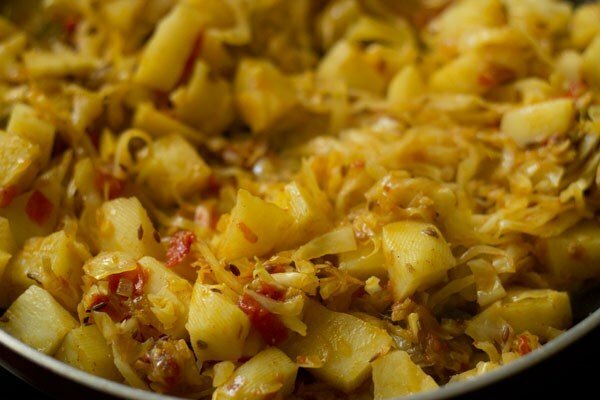 potatoes and cabbage make a good combination in dry veggie dishes. 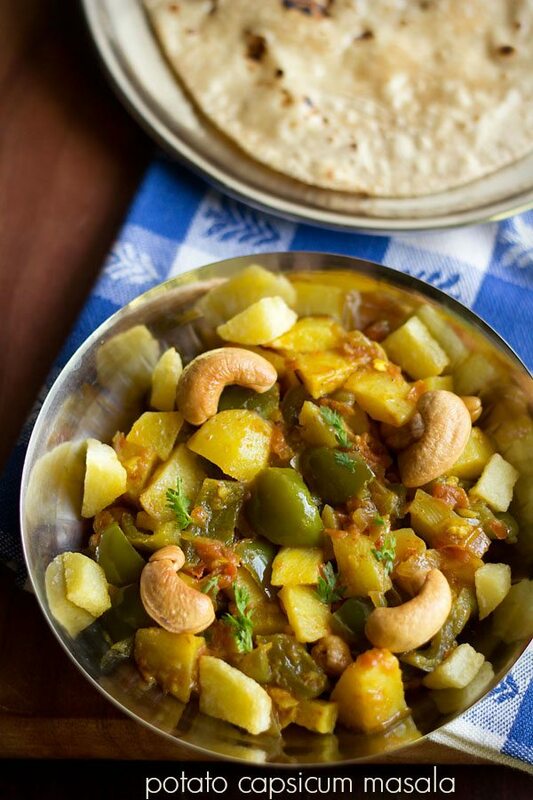 this easy punjabi aloo patta gobhi sabzi is how i make at home. 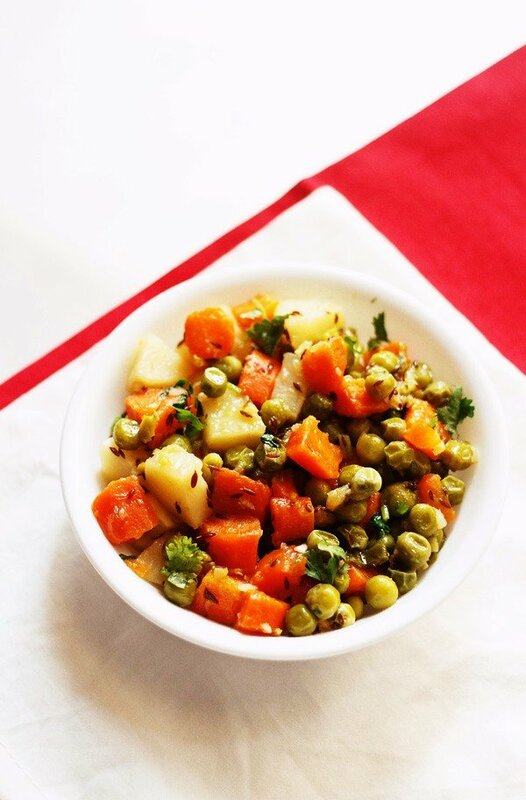 at times i also add some green peas to this sabzi. 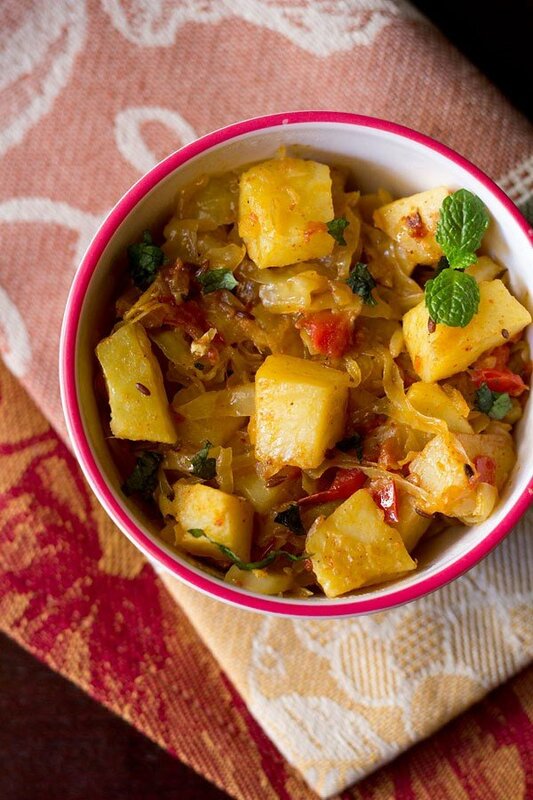 this potato cabbage sabzi goes very well with chapatis and even makes for a good side dish with a dal and rice. 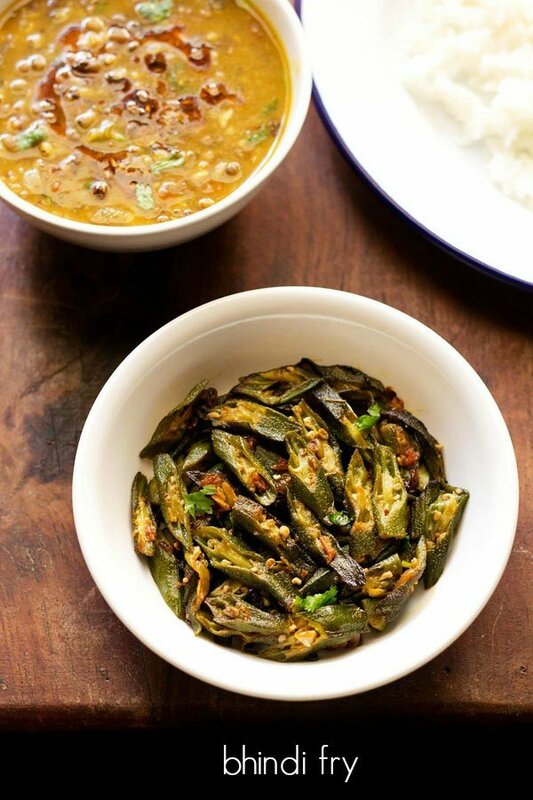 the sabzi along with soft phulkas also makes for a healthy tiffin box lunch. it also goes very well with bread. 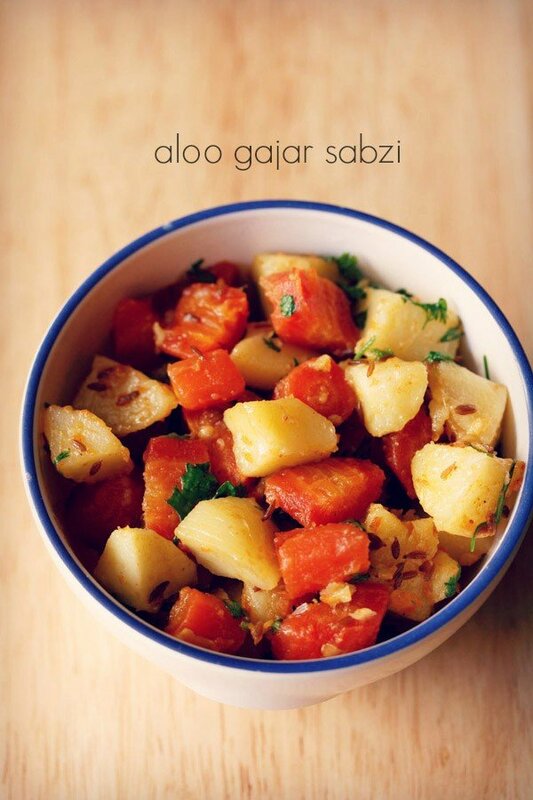 at times i also make some sandwiches with this sabzi. 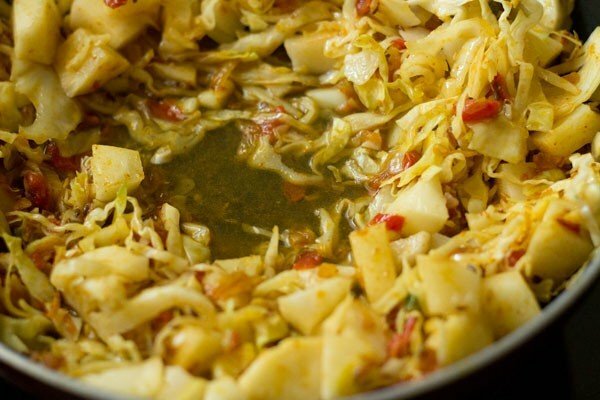 handy tip: before chopping cabbage, do blanch the cabbage in boiling hot water for 5 minutes. this to kill the insects or worms if any inside the cabbage. just halve or quarter the cabbage. then keep it in the hot boiling water for 5 minutes. 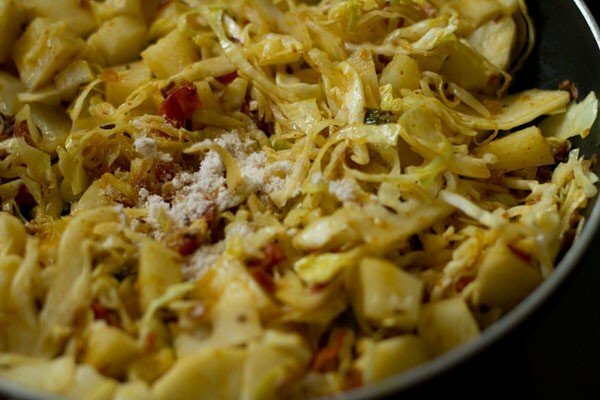 if not using the entire cabbage, then once cooled, keep the cabbage in the fridge or in the freezer. 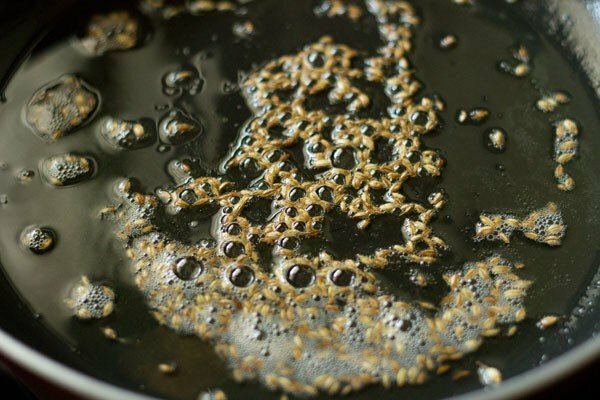 heat 1.5 to 2 tbsp oil in a shallow frying pan or kadai. add 1/2 tsp cumin seeds and saute till they splutter and change color. add 1/2 cup finely chopped onions. 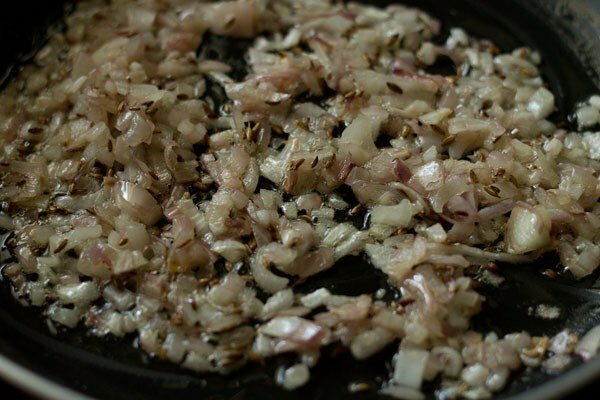 saute till the onions turn translucent or a light brown. add 1 tsp ginger-garlic paste. stir and saute till the raw aroma of ginger-garlic goes away. then add 1/3 cup tightly packed chopped tomatoes and 1 green chili, chopped. then add 1/4 tsp turmeric powder, 1/4 tsp red chili powder, 1/2 tsp coriander powder and 1/2 tsp garam masala powder or pav bhaji masala. stir and saute for two minutes more or till the tomatoes have softened. add the chopped potatoes and shredded cabbage. stir and mix. season with salt. stir again. add 1/2 cup water. stir very well. cover the pan tightly with its lid and simmer the veggies on a low flame. do check at intervals if the water has dried or not. if all the water has evaporated, then add some water. i used 2/3 cup water. 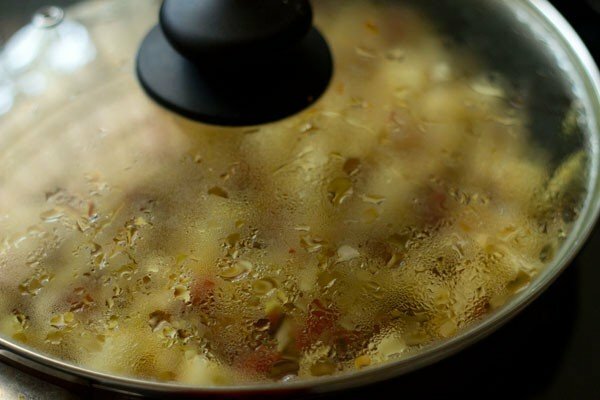 depending on the quality of veggies, the pan size etc, you can add from 1/2 to 2/3 cup water. do add more water if required. once the potatoes are cooked well, switch off the flame. this is a dry dish. there should be no water in the dish. if there is any water left, then cook without the lid, till all the water evaporates. 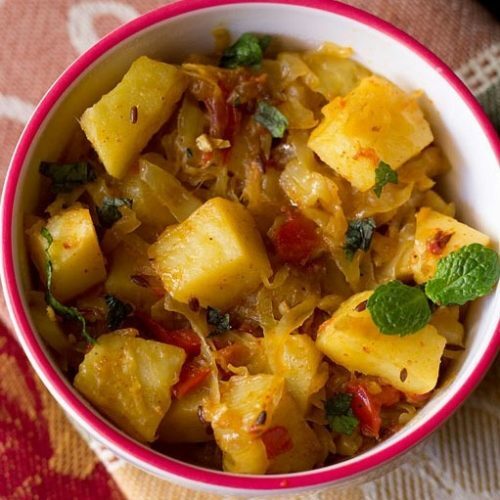 garnish with coriander leaves and serve cabbage potato with chapatis or as a side dish. 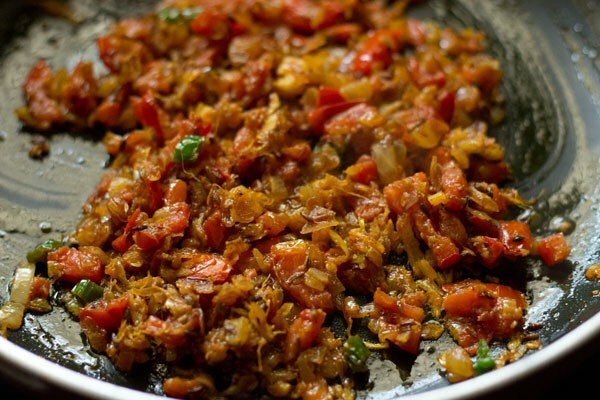 1. heat 1.5 to 2 tbsp oil in a shallow frying pan or kadai. add ½ tsp cumin seeds and saute till they splutter and change color. 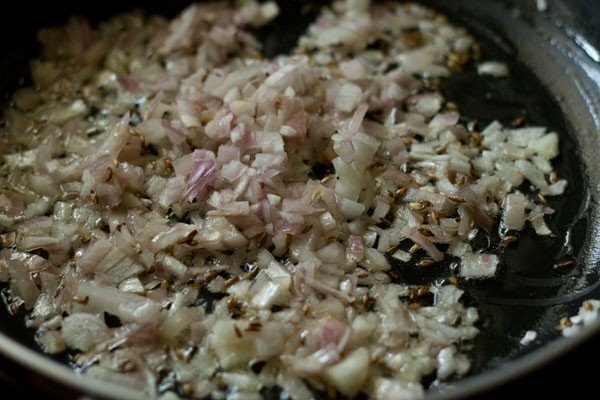 2. add ½ cup finely chopped onions. 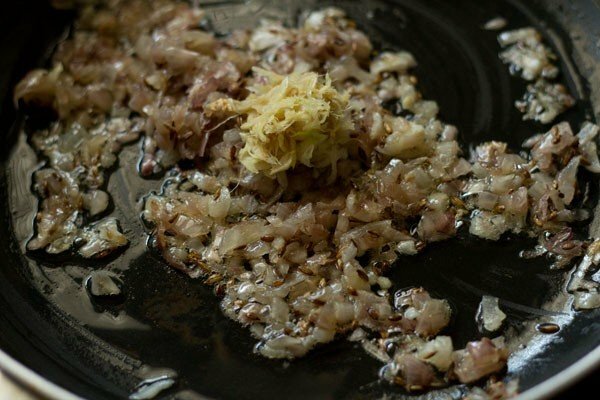 3. saute till the onions turn translucent or a light brown. 4. add 1 tsp ginger-garlic paste. stir and saute till the raw aroma of ginger-garlic goes away. 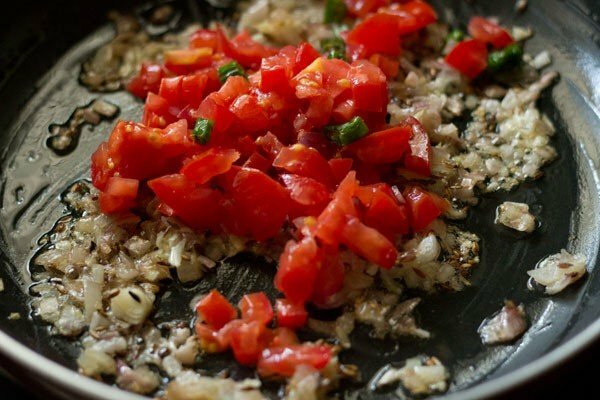 5. then add ⅓ cup tightly packed chopped tomatoes and 1 green chili, chopped. saute for 2 minutes. 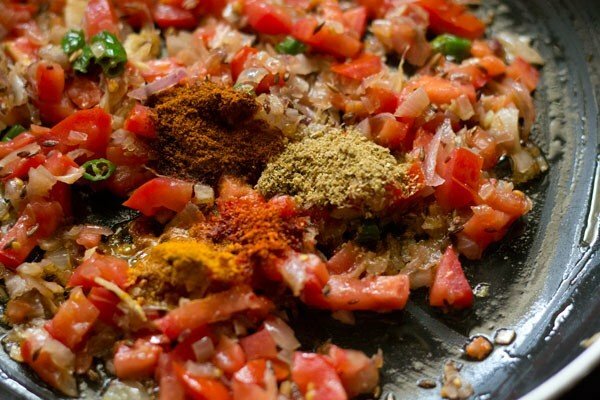 6. then add ¼ tsp turmeric powder, ¼ tsp red chili powder, ½ tsp coriander powder and ½ tsp garam masala powder or pav bhaji masala. 7. stir and saute for two minutes more or till the tomatoes have softened. 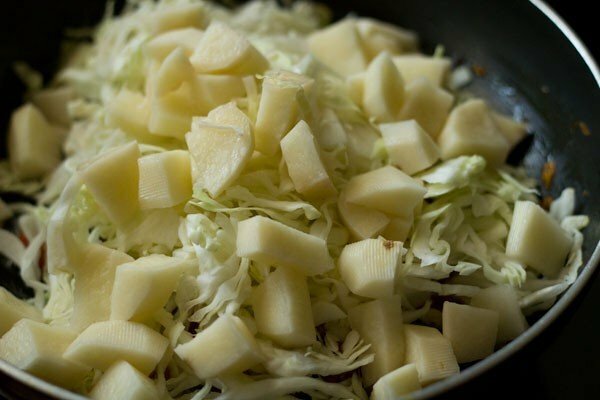 8. add the chopped potatoes and shredded cabbage. stir and mix. do chop the potatoes in small pieces, so that they cook fast. 9. season with salt. stir again. 10. add ½ cup water. stir very well. 11. cover the pan tightly with its lid and simmer the veggies on a low flame. 12. do check at intervals if the water has dried or not. if all the water has evaporated, then add some water. overall, i used ⅔ cup water. depending on the quality of veggies, the pan size etc, you can add from ½ to ⅔ cup water. do add more water if required. 13. once the potatoes are cooked well, switch off the flame. this is a dry dish. there should be no water in the dish. if there is any water left, then cook without the lid, till all the water evaporates. 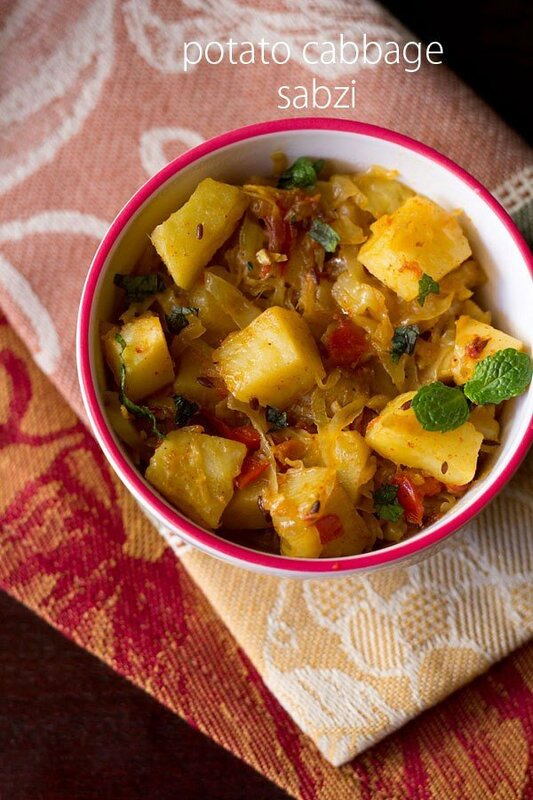 14. garnish with coriander leaves and serve potato cabbage sabzi with chapatis or as a side dish. i used mint leaves for garnish as i had run out of coriander leaves. you can also drizzle some lemon or lime juice on top of the dish before serving. Is there a need to fry the potatoes before adding it ? Because my potatoes are not becoming soft, what to do? no need. they get cooked along with the patta gobhi. sometimes due to the quality of potatoes it may take a longer time. so you can fry them in some oil and then add to the cabbage when the cabbage is cooked. All our help in the house is gone for the week and my parents are busy with work. I have been using your recipes to help my mother in the kitchen. Thank you so much! Your recipes are easy to follow yet elaborate and down-right delicious! Thank you very much, you’re a star! Welcome Aishwarya. Glad to know that you liked the recipes and their presentation. welcome sonali. nice to know that website is helping in cooking. Thanks Shivangi for sharing your motivating feedback. glad to know this jitendra 🙂 and pleased you cooking so many dishes now god bless you. All the above given recipes here r very useful to me.And its simple one too.love it. This recipe came at the right time. I am having cabbage at home so it came as an opportunity for me to try this. I tried your bread upma too and it was great. I wanna search your blog on chole but can’t find Google custom search box. I can see some changes in the web designing of the blog but I request the search box to be placed as before as it was easy for me before. Thanks a lot again and about my grandmother she was very happy on seeing your reply. i am working on the design and some things got messed up. the search bar also went missing 🙂 i will redesign and then add the search button. I wanted to ask you that can I add onion and garlic together and saute instead of adding one after the other. Will it make any difference in taste? yes you can add together. does not make any difference. I am posting a doubt here regarding eggless pound cake. I an unable to find comments section there. I baked the cake today, with maida. The lower part got burnt. Had to remove the burnt part. Do you have any idea where I went wrong? Is it because of over mixing? I am using a morphy Richards OTG. I usually pre heat the oven for 10 minutes. This time did it for 15 minutes. When i kept the loaf tin inside, only the lower part was on. There is no option to manually on it. Once I removed the browned parts, the cake is very very soft and tasty. But what could’ve gone wrong? Is it because the sugar was not melt completely? I felt there were granules left in the batter. All the ingredients has to be in room temperature? After melting the butter,do I need to wait til it cools down, to add the condensed milk?? Sorry for the long post. I really wanted to make this one prefect. hi karthika, when using the lower heating rod, also use the upper heating rod. and for even baking keep the cake in the center of the oven. if the cake pan is kept close to the lower heating rod, it will get browned quickly. since only the the lower part is getting heated up and there is no heat coming from the top rod, the top part of the cake will get cooked slower than the bottom part. for any cake, unless mentioned in the recipe, use both the top and bottom heating elements and keep the cake in the center of the oven. after melting butter, straightway add the condensed milk. no need to make it come at room temperature. then add the warm milk and sugar. its due to the warm temperature the sugar gets dissolved. at room temperature, it will be difficult to dissolve the sugar.